This traditional Jewish henna ceremony is having a major revival – and has evolved from its historical predecessors. Amongst Jews from the Middle East and North Africa, the pre-wedding festivities often lasted a week or more, whereas today they are closer to the big event – and sometimes incorporated into it – due to guests arriving from around the world for the celebrations. The application of henna to the bride, whether done over a period of three days, as in Yemen, or whether done multiple times over a two-week period, as in Morocco, is now often reduced to a single evening. Often the henna ceremony is combined with the Shabbat before the wedding – and where formerly the hatan and kalla may have been henna’ed in separate ceremonies, in separate locations, now the two ceremonies are joined together. Harif’s Creative Director, Michelle Huberman, has been involved in organising these events either at the homes of the bride’s family or alternatively in a restaurant or hotel setting. 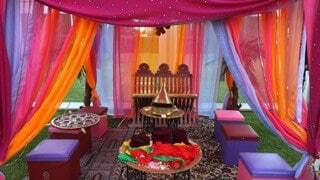 Decorations are distinctly Middle Eastern with the focus being on a beautifully-decorated tent, and inside, exotic seating for the couple with brass tables laden with platters of sweets, sugared almonds and candles as the centrepiece. The bride will wear a traditional takchita brocaded kaftan, often passed down from mother to daughter, and the groom a silk djellaba with a traditional tarbush fez. The guests are encouraged to dress in Middle Eastern style to add to the atmosphere of the simha – often changing during the evening. The bride’s mother – or female member of the family (who is neither divorced or widowed) then sets up home in the tent and the henna ceremony begins with her putting a gold coin in the palm of the kalla’s hand with some henna paste and it is wrapped with a red satin ribbon. The kalla’s mother – then does the same to the groom. This gives mazal to the couple. The stain stays on the palm of your hands for at least three days, and is a symbol to your friends and work colleagues that you’ve attended a recent simha. 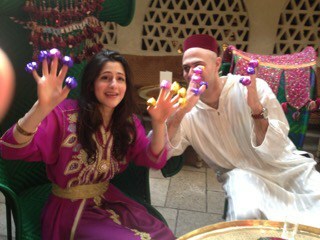 In the case of Iraqi hennas, the henna is applied to the fingertips of the couple and wrapped in colourful foils. In modern Moroccan weddings, where the henna ceremony follows the main wedding – the couple arrive on amariya thrones, being carried above the crowds, with the guests giving a gust of ululations to the happy couple. Moroccan tradition says that unmarried friends who receive henna in their hand, will be married within the year. If you’d like a henna ceremony for your own simha, please contact Harif’s Creative Director – Michelle Huberman – who can tailor-make an event for your own needs.